Team Giraffic Shark reviewed this attraction on October 19, 2017. Away from the theme park screams, nearby to Orlando lies A PETRIFIED FOREST. Featuring two trails, MEMORY SLANE and GHOST TOWN, there are plenty of scares to go around. MEMORY SLANE features a montage of the past 10 years of haunting at A PETRIFIED FOREST, whereas GHOST TOWN is an original, unique take on a haunted town in the Wild West. The creative team at A PETRIFIED FOREST displays creative, immersive settings highlighted by great laser and fog effects as well as a good team of actors to scare along the way. The variety of effects and scene types is impressive, adding interest and unique variety to the attractions. Close to major theme parks, A PETRIFIED FOREST will take you off the beaten path and deep into the forest. The question is, just how deep into the forest are you willing to go before your screams go unheard by the closest inhabitant? The Cast of A PETRIFIED FOREST is mostly strong and dedicated to scares, however there were a couple scenes where the team passed performers that barely moved, let alone an attempt to scare. Ginger Snapped is a delightfully creepy yet fun atmosphere character, who managed to find her way into GHOST TOWN with her sidekick, Zero, and showed up in several corners and around every twist and turn, being the perfect host for our trip through the Wild West. Other notable performances are from the fire-eater, the dreaded beast in a prom dress, and the laser swamp team in MEMORY SLANE, working every corner of that scene for maximum effect. Costuming is complete without being overdone. MEMORY SLANE is more of a hodge podge of different styles and looks based on the many years of haunts, whereas GHOST TOWN provides a more cohesive and unified look. Costumes make sense for the character and fit the locations and scenes well. While there is nothing jarring in the costuming, there is also little that stands out. Similarly, makeup is well done and fits the characters, theme, and location as well, creating a solid look for the attractions. Customer Service is a high focus at A PETRIFIED FOREST. Security checks are in progress at the front including metal detection wands (though the lady blatantly stated that she was looking for knives and guns, and asked if we had any). Ticket booth personnel were extremely helpful and friendly as well as attendants at the attraction queues. Our host for the night, Ginger, was engaging, friendly, and even though she was in character with her snake, Zero the Danger Noodle, she was extremely hospitable and welcoming. The haunt is easy to find via GPS, and parking is simple, in an unpaved lot with parking attendants. Please note that these are trails through the woods. While the team has done a great job at clearing pathways, there are still moments of slightly uneven footing and exposed roots, etc. Though these never presented a true trip hazard, attention to footing is strongly recommended. A PETRIFIED FOREST has created a wonderful façade this year in the form of a street straight out of the Wild West. This is a great setting for the haunts this year, especially for GHOST TOWN, perfectly fitting in that theme. In the vendor area surrounding the haunts, bands play on a stage, also themed to the Wild West this year, a fun backdrop for the band. Several vendors also fill the area including food vendors, a photography vendor featuring posed photos in the haunt, as well as a pet shelter with adoptable puppies and kittens. Actors roam the area to creep out Guests and provide scares before and after Guests travel the trails. Compared to previous years, A PETRIFIED FOREST has stepped up their game for 2017 with the fully themed façade as well as a great themed stagecoach photo op, tying the entire vendor area together thematically. A PETRIFIED FOREST relies primarily on traditional effects seen throughout a haunted trail, though does have a few surprises up their sleeve, especially with some fog, lighting, and laser effects. This, in combination with some great large-scale homemade puppets, create some fun surprises throughout the trails, and are entirely unique to A PETRIFIED FOREST. Perhaps one of the most stunning moments was the spider-infested portion of GHOST TOWN. The webs, layout, and effects combined with lasers created a striking image complete with webs brushing against faces, everyone’s favorite real life experience. Unfortunately, this gorgeous scene had a certain lack of scares and performers, a missed opportunity, while Guests are easily distracted by the webs and lighting. MEMORY SLANE is a montage house of the past 10 years, as this year marks the 10th anniversary for A PETRIFIED FOREST. As some of our team was visiting for the first time, and others had only been at maximum the past three years, several scenes were lost in this attraction, especially out of context of the full house of the past. While certain scenes were great, others were slightly confusing, again with the lack of context of the full house, and a common thread or story line could have tied the whole thing together especially for those that may be seeing these scenes for the first time. GHOST TOWN is well done from start to finish, taking a loose theme of a Wild West town overrun by ghosts, and expanding it to include some common phobia scenes along the way. The Cast fits the theme very well, sticking to the western theme, dialogue, and costuming as well. The runaway mine cart beginning is the perfect transport to this world as well. 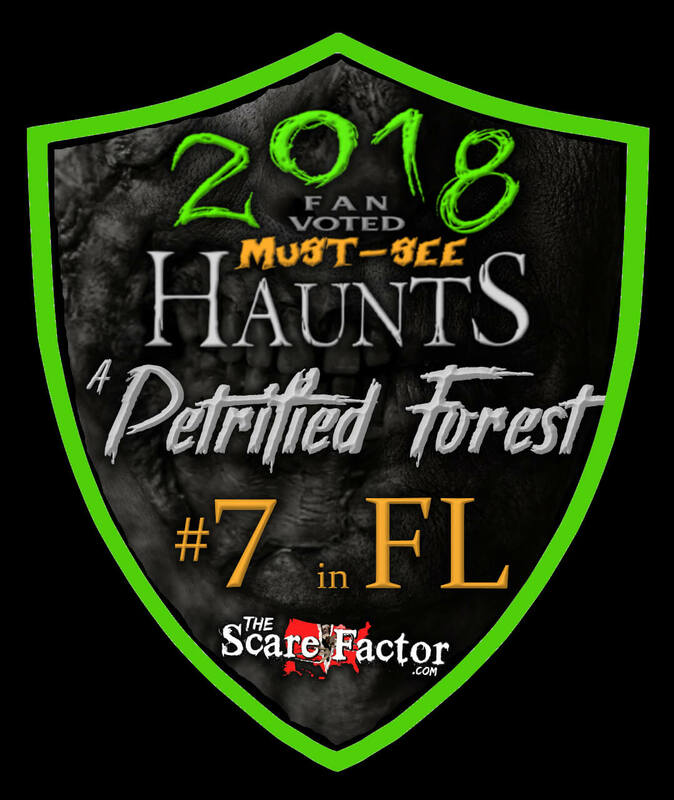 While A PETRIFIED FOREST is not an attraction that is going to send you running for the hills, it will cause you to jump, get startled and spooked right there in the forest. The Cast does make a good effort to spread out scares and dialogue through the entire group, not just focusing on the front of the group. There are some great distraction elements in the attraction leading to some good scares when the cast follows through. Great scenery, lighting, effects, etc, create perfect distractions for Guests looking to catch more of the details in the very dark maze, only to be blindsided occasionally by a hidden performer. This tactic could be amplified through the attractions once strong distraction points in the design are determined. While the finale is strong, and ties back to the theme, especially for GHOST TOWN, it is shared between both attractions, since they exit at the same location. Fortunately, the ending is rather strong, however for those not inclined to be scared in those types of situations, a second time through the same finale will prove ineffective as well. For those looking for a greater scare, A PETRIFIED FOREST features a Total Eclipse night, where most lights are turned off throughout the trails, with only one glow stick per group given, should it not be taken from a creature within the forest. For two moderate length trails (about 19 minutes total), the value of the haunt is well matched with the ability to spend several hours at the attraction. Between the unique food offerings and the live band, there is plenty to do before, after, or between the trails. The creative team does a great job utilizing available space in the forest, featuring several small tight corridors along with many larger scenes too, creating variety and increasing creative interest. 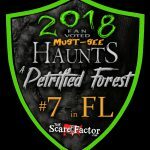 If you find yourself in the Orlando area during the Halloween season, take a trip away from the theme parks and over to Altamonte Springs and see what lies within A PETRIFIED FOREST.